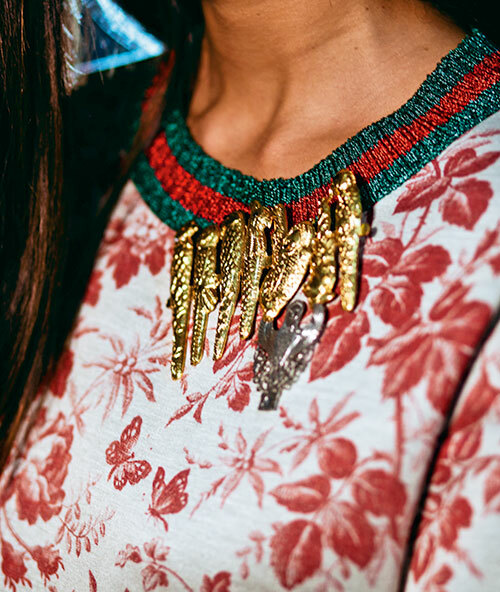 You’d be living under a rock, if you don’t know how far and wide Gucci has ‘bloomed’ (we couldn’t resist making those blooms our own, too). 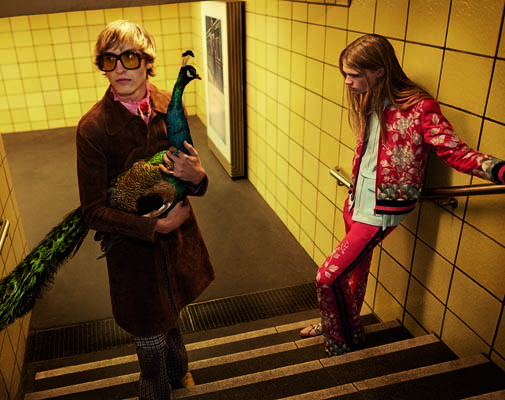 Taking off from the street-crossed lovers in Los Angeles, Gucci travels to Berlin to shoot their spring summer 2016 campaign. The same floral motifs and granny fashion is given an 80s inspiration in their summer catalogue. We’ve shortlisted some of the coolest products you should be saving for this summer. Also, don’t miss the dreamy atmosphere that comes alive in the surreal city, in their short film. GG Eden printed single breasted coat with brown suede belt and the crazy haircut. Dark vermont lace embroidered 70's shirt on the boyfriend. 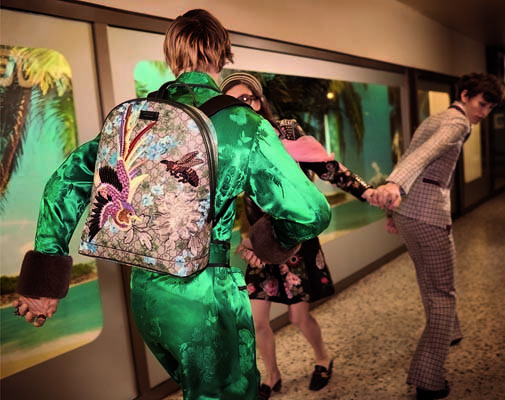 The Gucci Blooms backpack for all the globetroting this year. Black tulle organdy sleeveless crew neck dress with embroidery. Bengal goat suede coat with grainy leather web detail (and peacock as pet). If you’re still feeling the Gucci love, check out our* December fashion spread with the cruise collection, which is in stores now. 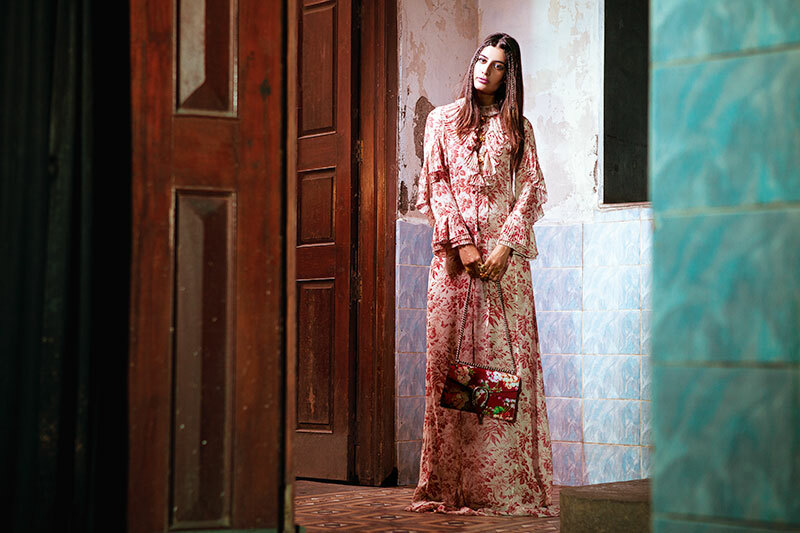 Romantic cerise erbarium printed silk light georgette long sleeve embroidered gown with flounce detail, small shoulder bag in romantic cerise geranium printed leather with tigerhead detail, both from Gucci, Mumbai. Romantic cerise erbarium printed felted modal jersey 3/4 sleeve crew neck sweatshirt with web trim, oil yellow voile lurex pleated skirt, high heel pumps in mimosa galassia with fringes and GG detail, all from Gucci; jute fringed cuff, from Chiria. Both in Mumbai. Sirina silver brooch, by Eina Ahluwalia, Kolkata. Gold metal birds brooch, by Mrinalini Chandra, Mumbai. Sacred geometry multi-ring (on little finger), by Eina Ahluwalia, Kolkata. Four petal floral rings (on forefinger), by Mrinalini Chandra, Mumbai. Sophisticated pink/prune/black poly georgette bonded lace sleeveless pleated dress, high heel pumps in platino galassia with fringes and GG detail, medium shoulder bag in cuir leather with GG closure and tigerhead detail on the flap, all from Gucci; multicoloured stone headband, by Nitya Arora, for Valliyan. Both in Mumbai. Bright emerald blooms printed techno duchesse quilted single breasted coat, and mid heel gladiator boots in platino galassia with bows and pearls details, both from Gucci; multicoloured stone necklace, by Nitya Arora, for Valliyan; dull gold bead necklaces with chains, from Chiria. All in Mumbai. 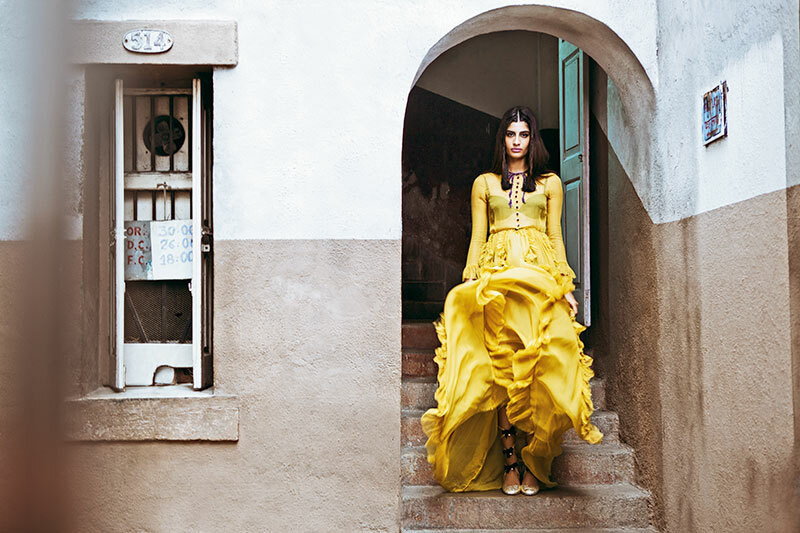 Oil yellow silk chiffon long sleeve crew neck embroidered pleated gown, mid heel gladiator boots in platino galassia with bows and pearls details, both from Gucci, Mumbai. 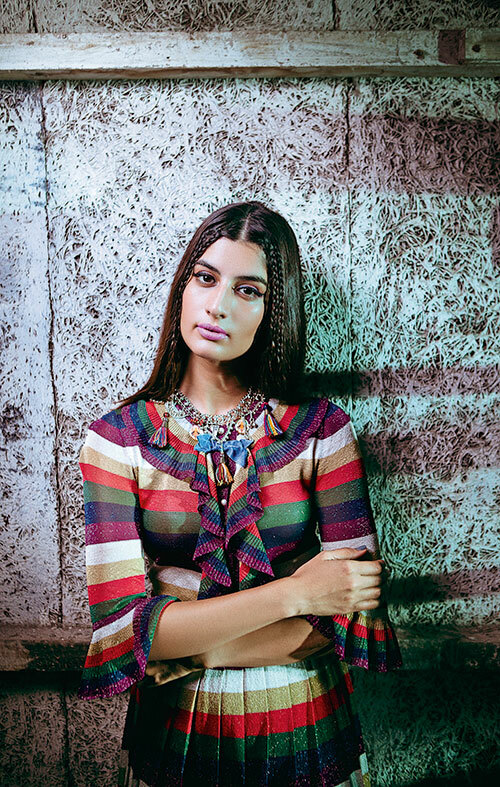 Multicoloured extrafine shiny viscose striped 3/4 sleeve dress, from Gucci; thread and payal necklace, from Chiria. Both in Mumbai. Lotus fractal lariat necklace, Love necklace in Hindi, both by Eina Ahluwalia, Kolkata. Cuir leather women’s belt with coloured strass and feline head buckle in antique shiny brass finish, from Gucci; filigree haathphools, by Mrinalini Chandra. Both in Mumbai. Camel chevron printed silk-wool georgette long sleeve shirt and pleated skirt, from Gucci, Mumbai. 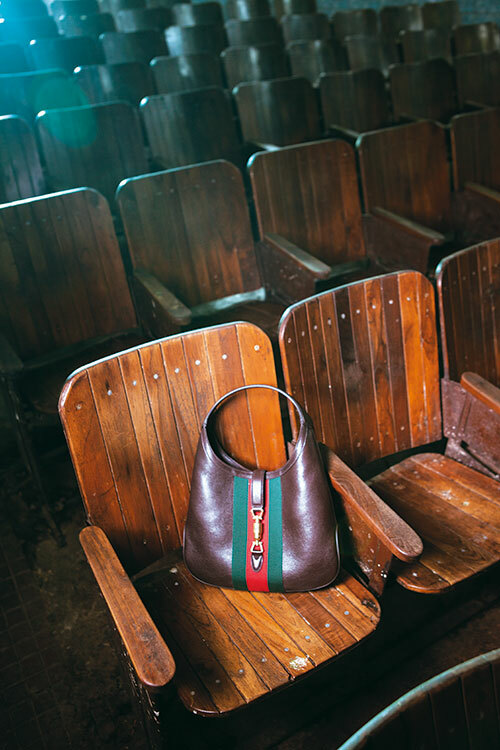 Medium hobo in dark cocoa leather with green-red-green web detail and piston closure, from Gucci, Mumbai.